This is a shared cache. Instances of this class should typically be fetched with the method $title->getBacklinkCache(). Ideally you should only get your backlinks from here when you think there is some advantage in caching them. Otherwise it's just a waste of memory. Definition at line 46 of file BacklinkCache.php. Definition at line 100 of file BacklinkCache.php. Serialization handler, diasallows to serialize the database to prevent failures after this class is deserialized from cache with dead DB connection. Definition at line 127 of file BacklinkCache.php. Definition at line 134 of file BacklinkCache.php. Create a new BacklinkCache or reuse any existing one. Currently, only one cache instance can exist; callers that need multiple backlink cache objects should keep them in scope. Definition at line 113 of file BacklinkCache.php. 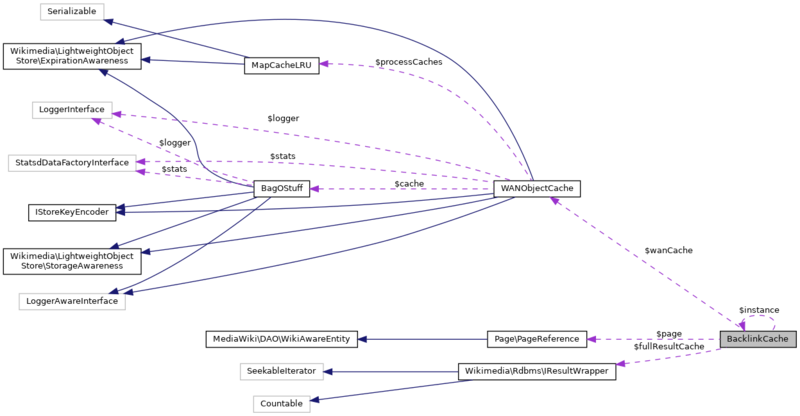 Referenced by Title\getBacklinkCache(), and WikiPage\onArticleDelete(). Definition at line 522 of file BacklinkCache.php. References $dbr, $res, as, getDB(), TitleArray\newFromResult(), NS_FILE, and title. Definition at line 276 of file BacklinkCache.php. References getDB(), getPrefix(), LIST_OR, null, Hooks\run(), and title. Get the replica DB connection to the database When non existing, will initialize the connection. Definition at line 155 of file BacklinkCache.php. References $db, DB_REPLICA, and wfGetDB(). Referenced by getCascadeProtectedLinks(), getConditions(), and queryLinks(). Cached in process memory only. Definition at line 171 of file BacklinkCache.php. Definition at line 332 of file BacklinkCache.php. References $wgUpdateRowsPerJob, getLinks(), makeCheckKey(), partition(), and title. Definition at line 247 of file BacklinkCache.php. Referenced by getConditions(), and queryLinks(). Definition at line 322 of file BacklinkCache.php. Definition at line 572 of file BacklinkCache.php. Referenced by clear(), getNumLinks(), and partition(). Returns an array giving the start and end of each range. The first batch has a start of false, and the last batch has an end of false. Definition at line 392 of file BacklinkCache.php. References $res, list, makeCheckKey(), partitionResult(), queryLinks(), title, and wfDebug(). Definition at line 481 of file BacklinkCache.php. Definition at line 184 of file BacklinkCache.php. References $options, $res, getConditions(), getDB(), getPrefix(), and wfDebug(). Referenced by getLinks(), and partition(). Definition at line 146 of file BacklinkCache.php. Definition at line 86 of file BacklinkCache.php. Referenced by getDB(), and setDB(). Definition at line 72 of file BacklinkCache.php. Definition at line 48 of file BacklinkCache.php. Definition at line 62 of file BacklinkCache.php. Definition at line 91 of file BacklinkCache.php. Definition at line 77 of file BacklinkCache.php. Definition at line 93 of file BacklinkCache.php.